Bachmann 91421 G Thomas the Tank Engine with DCC Sound (with moving eyes). 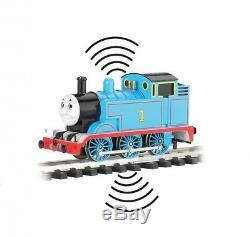 This is a Bachmann 91421 G Scale Thomas the Tank Engine with DCC Sound (with moving eyes). Features include: DCC sound-equipped, dual-mode decoder for DCC or analog operation, whistle, chuff, and cylinder blow down, DCC and/or manual volume control with on/off switch polarity switch for operation according to NMRA or Large Scale model railroading practices additional character sound suites available through DCC CV selection only. Character sound suites include Thomas, Percy, James, Edward, Henry, Gordon, Emily, Spencer, and Toby. Whistle or bell per prototype, moving eyes and international-style hook and loop couplers. Standards for all toy train related accessory items apply to the visual appearance of the item and do not consider the operating functionality of the equipment. Condition and Grading Standards are subjective, at best, and are intended to act as a guide. This item is brand new from the factory. May have store stamps and price tags. The Trainz SKU for this item is P12179358. Track: 12179358 - 1027-A (Suite 2740-200) - 001 - TrainzAuctionGroup00UNK - TDIDUNK. Please note, after seven days our systems may automatically re-list unpaid items. Explain why the item does not meet your expectations and how you would like us to handle the issue. If your item has been damaged try to include a photograph of the actual damages. Well do our absolute best to make you happy. Make sure to include your contact and order information when you return your items. The item "Bachmann 91421 G Thomas the Tank Engine with DCC Sound (with moving eyes)" is in sale since Wednesday, August 1, 2018. This item is in the category "Toys & Hobbies\Model Railroads & Trains\G Scale\Other G Scale". The seller is "trainz" and is located in Buford, Georgia. This item can be shipped to United States, all countries in Europe, all countries in continental Asia, Canada, Australia, South africa, Mexico, New Zealand, Brazil, Chile, Colombia, Costa rica, Panama, Trinidad and tobago, Guatemala, Honduras, Jamaica, Antigua and barbuda, Aruba, Belize, Dominica, Grenada, Saint kitts and nevis, Saint lucia, Montserrat, Turks and caicos islands, Barbados, Bermuda, Bolivia, Ecuador, Egypt, French guiana, Guadeloupe, Cayman islands, Martinique, Nicaragua, Peru, Paraguay, Reunion.